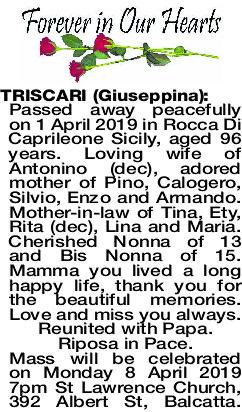 Passed away peacefully on 1 April 2019 in Rocca Di Caprileone Sicily, aged 96 years. 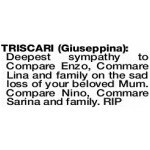 Loving wife of Antonino (dec), adored mother of Pino, Calogero, Silvio, Enzo and Armando. Mother-in-law of Tina, Ety, Rita (dec), Lina and Maria. Cherished Nonna of 13 and Bis Nonna of 15. Mamma you lived a long happy life, thank you for the beautiful memories. Love and miss you always. Reunited with Papa. Riposa in Pace. Mass will be celebrated on Monday 8 April 2019 7pm St Lawrence Church, 392 Albert St, Balcatta. In loving memory of a kind and gentle lady. 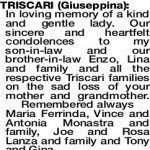 Our sincere and heartfelt condolences to my son-in-law and our brother-in-law Enzo, Lina and family and all the respective Triscari families on the sad loss of your mother and grandmother. 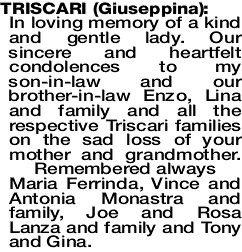 Remembered always Maria Ferrinda, Vince and Antonia Monastra and family, Joe and Rosa Lanza and family and Tony and Gina.